Have a question on CR-V? CR-V is available in 3 different colors - Grey, Crystal Black and White Diamond. Watch latest video reviews of Honda CR-V to know about its interiors, exteriors, performance, mileage and more. The Honda CR-V has time and again proved that an SUV does not need to look butch, huge, and muscular to appeal straight to the hearts. 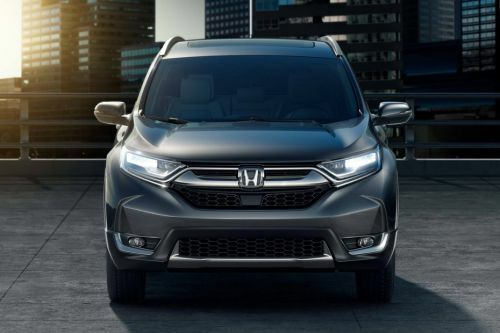 In all the five generation models it has sold, the CR-V has always been an SUV styled as a crossover, with dimensions large enough to be titled as SUV. The first generation CR-V was launched back in 1995, and since the start, it has been the highest selling SUV from Honda, and one of the most loved too. The current generation Honda CR-V has not only evolved in terms of looks but has also grown up in size, thus making it the largest CR-V till date. For the UAE, the Honda CR-V is available in three different variants, LX 2WD, EX Plus 4WD, and Touring 4WD, all of which come with a 2.4-litre petrol engine mated to a CVT transmission. Paint schemes on offer for the Honda CR-V include Lunar Silver, Modern Steel, White Diamond, Crystal Black, Obsidian Blue, Basque Red, and Gunmetal. The Honda CR-V feels even more refreshing as soon as you enter its cabin. The new generation model does get an all-new cabin, which unlike all the previous generation CR-Vs and other current Honda cars, is not tilted towards the driver, but has a centre oriented design. The steering wheel is all new and feels premium due to thick buttons and nice chrome inserts on all the three spokes. The instrument console looks very fancy and comes with a full digital theme with three different partitions, one each for speedometer and tachometer, MID and fuel gauge and tell-tale lights. The whole black theme for the cabin does make it look a bit gloomy. However, there is a nice thin chrome strip running on the upper portion of the dashboard. Also, the cabin gets fake wood strips running all the way on the side doors and the lower portion of the dashboard, which try to lift up the overall ambience of the interiors of CR-V. When it comes to features, one must be happy that this new CR-V does not feel lacking in comfort and convenience as well as cosmetic features as compared to its previous generation models. The CR-V comes packed with features like a sunroof, power tailgate with adjustable height, dual zone climate control, paddle shifters, leather upholstery, steering mounted audio and Bluetooth controls, 8-way power adjustable driver’s seat, 7-inch touchscreen infotainment system with Bluetooth, reverse camera, navigation, Apple Carplay and Android Auto and 8 speakers, electric parking brake, push-button start with keyless entry, rain sensing wipers, remote starter button, and cruise control. The UAE-spec Honda CR-V misses out on the third row which are available in some of the other global markets. However, this also means that this particular 5-seater CR-V has got a tremendous boot space and an ample amount of interior cabin space with improved legroom and headroom. The Honda CR-V has always been that one SUV which broke the code by being sleeker looking as compared to all of its other butch looking, similarly priced rivals. In this new generation too, the CR-V looks sleek and most aerodynamic looking SUV which has the ability to sweep you off your feet just by the way it looks. At the front, the Honda CR-V has got a new larger but sleeker looking front fascia, which bears a family resemblance to all the current generation premium Honda offerings like the HR-V and Accord. The hexagonal front grille consists of a thick chrome garnish on the upper partition and a large honeycomb grille on the lower bulkhead, thus dividing the front grille into two parts. Adjacent to the upper chrome partition of the front grille is the sharp looking full LED headlamps which add some bling factor to the front face of the CR-V.
Moving towards the sides, the Honda CR-V now looks even more dramatic than the previous generation model, thanks to the larger side glasses and raised ground clearance. These alterations, along with the traditional-for-CR-V feature of inclined rear quarter glass, make the SUV look bold. The chrome strip on the side body cladding, as well as 18-inch machined alloy wheels, add some elegance to the side profile. At the rear, the Honda CR-V looks even more striking and is perhaps the best angle to look at the vehicle. One does get large L-shaped tail lamps with LED inserts, which extend all the way from the centre to the upper corners of the vehicle. There is a nice thick chrome strip running between the tail lamps, which add some more visual mass to the rear. As before, the CR-V has a large trapezoidal housing for the number plate on the lower portion of the rear door. As compared to the old-school SUVs, the Honda CR-V has always been one a car all like to drive. With this new generation model, this particular trait has not witnessed any changes, despite the raised ride height. The overall ride quality is on a slightly stiffer side but isn’t anywhere close to being uncomfortable. Advantage? Thanks to a sturdy monocoque frame, the CR-V feels sure-footed on straights as well as corners with equal composure, something which is rarely seen on an SUV. The new Honda CR-V retains its mechanical strengths from the previous generation model, and centres all towards its heart – its 2.4-litre four-cylinder petrol engine. The engine produces a maximum power output of 184 bhp and maximum torque output of 244 Nm. Mated to a CVT transmission, the engine feels as refined and smooth as before, and with some minor changes and tuning advancements, it now feels even more responsive. Thanks to paddle shifters, the driving experience of the CVT transmission is enhanced with a minimal rubber-band effect. Honda is known for being one manufacturer which has been a pioneer in equipping its cars with class-leading safety measures. The Honda CR-V too comes with some really noteworthy safety features like dual, side and curtain airbags, driver attention monitor, ABS with EBD and electronic brake booster, traction control, hill start assist, agile handling assist, vehicle stability assist, emergency stop signal, tire pressure monitoring system, immobilizer, and ISOFIX mounts for child seats. The Honda CR-V has always been one SUV for all those people who loved being on both the driver as well as rear passenger seats. While the new CR-V takes the driving experience to an even higher level, the higher quality and equipped interior cabin make the overall cabin even more luxurious. The increase in space and features now make it a full and much more practical SUV than SUV. Adding to it, its core strengths of engine performance and swanky exterior design too have seen an evolution, making it an even better SUV in terms of appeal. No wonders than despite its crossover roots, the Honda CR-V has been giving a tough fight to the traditional ladder-on-frame SUVs. What is the price of Honda CR-V? On road prices of Honda CR-V in starts from AED94,900 for base variant LX 2WD, while the top spec variant EX Plus AWD costs at AED119,595 . What are the colors options available in Honda CR-V?